I love burrito bowls, they're full of flavor and very healthy! This recipe allows a couple shortcuts or you can make everything from scratch. You'll want to prep a large quantity so you can make this meal all week. 1. Butterfly chicken breast. Mix together fajita seasoning, vinegar, olive oil and 2 tablespoons of water. 2. Pour marinade over chicken and allow to marinate 15-30 minutes. 3. Cook quinoa according to package directions. 4. Preheat grill. Grill chicken, bell peppers and corn. Cook chicken about 5-7 minutes, turning once, until cooked through. Cook bell peppers and corn till tender. 5. Dice bell peppers and remove the kernels with a sharp knife. 6. In a large mixing bowl combine corn, bell peppers, red onion, black beans, quinoa, cilantro, lime juice, olive oil, salt and pepper to taste. 7. 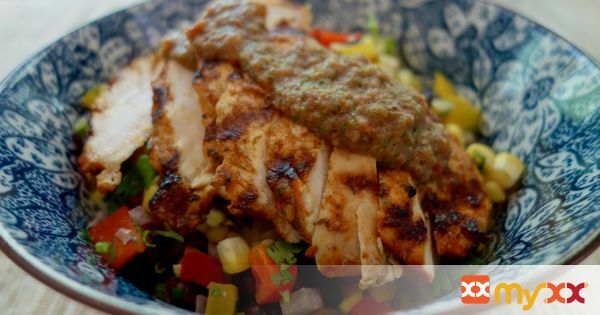 Serve each bowl with quinoa mixture, sliced chicken breast, salsa and guacamole. Enjoy!